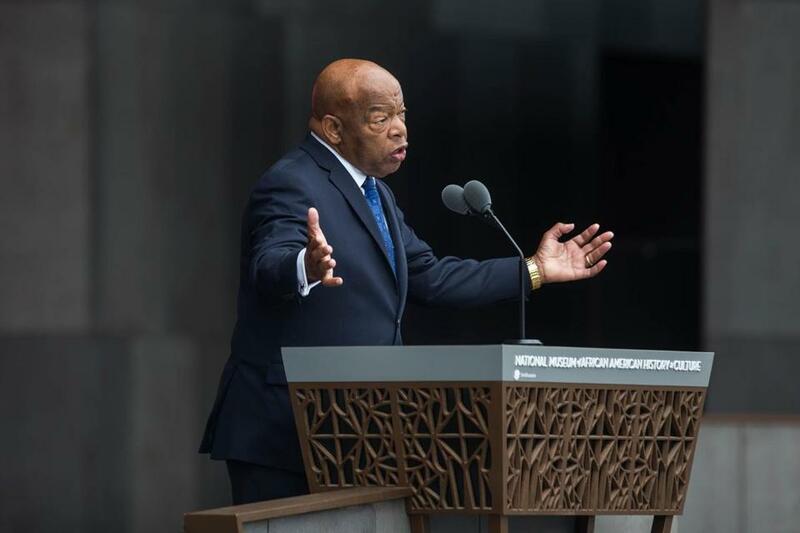 This past Saturday was the opening of the new National Museum of African-American History. Whenever I get back to Washington, DC, I am going to spend at least 2 days at this museum. It looks magnificent. It was a glorious opening ceremony. Lonnie Bunch, the head of this project, who strapped it onto his back, and made it happen. Pete Souza: Vice President Joe Biden greets 99-year-old Ruth Bonner, a daughter of a young slave who escaped to freedom, as Dr. Jill Biden greets another generation of the Bonner family who rang the Freedom Bell with the President and First Lady to mark the official opening of the Smithsonian National Museum of African American History and Culture. President Obama hugs Congressman John Lewis. This entry was posted in African Americans, Black History, Open Thread, Politics and tagged 3chicsPolitico, African Americans, Black History, National Museum Of African American History, Open Thread, Politics, Smithsonian Museum. Bookmark the permalink. Nina Turner can’t take anymore of Trump / Hillary either. I was just thinking, they were expecting 100 million viewers. I wouldn’t be surprised if there were 90 million dropouts before halftime. Donald is getting skewered on Twitter as one might expect. I really hope this “debate” hurts him badly in the polls, as it should. It’s horrible. I didn’t know what to expect never having watched the GOP debates. This is a great post about the new museum, Rikyrah. Mr. Lonnie Bunch must be the happiest guy in the USA right now. This is an incredible achievement for all of those involved and I absolutely have to see this museum someday. I’ve been watching it for the last 45 minutes and I can’t take anymore. They aren’t debating, they’re arguing and I really haven’t learned a thing from either of them that I haven’t heard before. Lester Holt needs to do a better job of interrupting them, but I can also see where that is difficult with these two, especially Trump. I just left the TV and came here for the same reason, Liza. I can’t take it anymore, either. It was, I agree. Upsetting. Glad you’re having a super time! Hey, Ametia. Glad you’re enjoying your time off. Early fall is the best time to take a vacation, IMO. Well, that needs to stop. It shows that they want the audio but not the visual. We contacted the Danville Police Department to ask whether the department had such a policy in place (i.e., allowing officers to obstruct dash cams) and inquire about the images circulating on social media, and the officer with whom we spoke was aware of the photographs and stated that no such policy in Danville permitted police to deliberately obstruct their vehicle dash cams. I don’t believe anything they say. Hillary Clinton has had a pretty good week, all things considered. Clinton’s appearance on Between Two Ferns was widely watched and well received, humanizing her in a millennial-friendly setting. She has refocused her campaign to be less about Trump’s weaknesses than on her agenda to improve Americans’ lives. Both of these should help shore up her weakness with millennial voters. Another big help, if she can stay focused on it and get the press to cover it in more depth, is her proposal to increase the estate tax to 65%. It’s the sort of economic populist approach that the country needs, and that the voters Clinton needs to turn out will appreciate. This is terrible on many levels. Debates are supposed to illustrate how the candidates would respond to a variety of policy challenges. Those challenges depend on having a shared set of facts: a 10% unemployment rate would create a very different policy environment from a 5% unemployment. If each candidate is claiming different unemployment statistics, you don’t have a debate. You have a noisy argument that sheds a lot of heat and no light. It’s a useless exercise. Moreover, the example she gave is frankly bizarre. It’s one thing to dispute, say, models of economic growth or the efficacy of various foreign policy approaches. But the unemployment rate? That has a single reliable source: the Bureau of Labor Statistics. That is literally the only legitimate source for unemployment numbers. There is a small debate within economic circles as to whether the BLS unemployment statistics appropriately reflect the reality of economic pain within the country, in terms of not counting people who stopped looking for work or potentially ignoring too many of the underemployed. Some people use a U6 model for unemployment rather than a U3 model. But the starting point for any reasonable discussion of the unemployment rate is the official BLS number. If one candidate says that unemployment is at 5% and the other candidate says it’s much higher, it’s absolutely the job of a moderator to inform the public that the official BLS statistics support one candidate’s assertion. The candidate trying to claim an alternate reality should then be pressed to say why they disbelieve the BLS, proving either that they’re a conspiracy monger, or potentially that they have a sophisticated critique of the government’s economic model–which would certainly be an interesting and informative conversation, but one that can only happen in the context of a single, authoritative factual source acknowledged by both candidates. I, too, am America. The great historian John Hope Franklin, who helped to get this museum started, once said, “Good history is a good foundation for a better present and future.” He understood the best history doesn’t just sit behind a glass case; it helps us to understand what’s outside the case. The best history helps us recognize the mistakes that we’ve made and the dark corners of the human spirit that we need to guard against. And, yes, a clear-eyed view of history can make us uncomfortable. It’ll shake us out of familiar narratives. But it is precisely because of that discomfort that we learn and grow and harness our collective power to make this nation more perfect. That’s the American story that this museum tells: one of suffering and delight, one of fear but also of hope, of wandering in the wilderness and then seeing out on the horizon a glimmer of the Promised Land. Thanks for your fabulous post on the African American museum dedication, Rikyrah! “I want you to think about this. Consider what this artifact tells us about history, about how it’s told, and about what can be cast aside. On a stone where day after day for years men and women were torn from their spouse or their child, shackled and bound, and bought and sold and bid like cattle on a stone worn down by the tragedy of over a thousand bare feet. 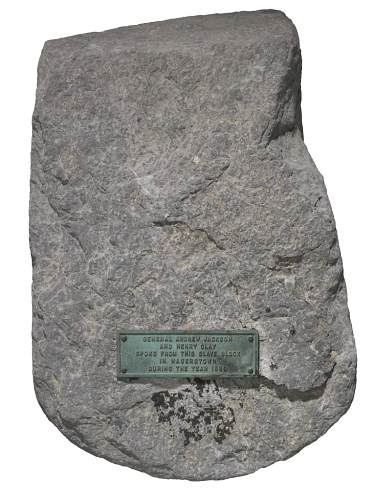 For a long time the only thing we considered important, the singular thing we once chose to commemorate as “history” with a plaque, were the unmemorable speeches of two powerful men. Rikyrah made it, Yahtc. She did an outstanding job. I see you made the correction for me, SG2. Thank you so much!